Technomics seeks out various professional events, conferences and opportunities, we encourage our employee-owners attendance as part of their continuing education and growth. Professional events not only provide a new learning opportunity, but are a fun and interesting way to network as well! 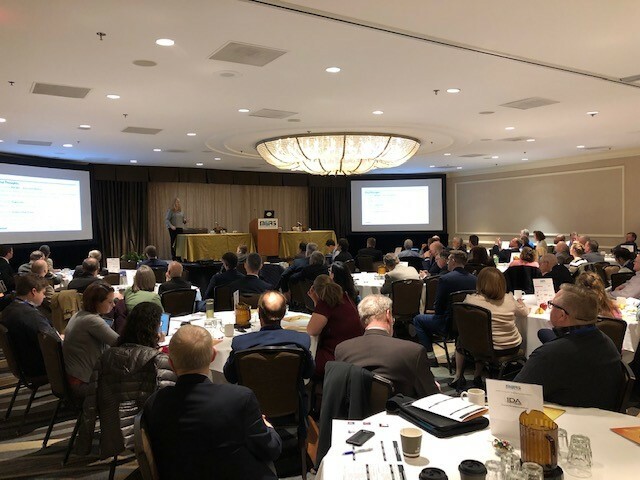 Such an event came along in December when several Technomics employee-owners attended the Military Operations Research Society(MORS) annual Emerging Techniques Forum (ETF) at the Hilton Mark Center in Alexandria, Virginia. More than 100 participants from around the world attended the two-day event with a desire to push the envelope on the cutting-edge techniques and capabilities that will improve data analysis. The shared goal was to provide decision makers with faster and more accurate answers to the challenges they face every day. Dr. Anne Robinson, the Executive Director of Global Supply Chain Strategy, Analytics and Systems at Verizon, kicked off the event with a key note address. Dr. Robinson shared her vast knowledge and experience as a high-level executive and explained her perspective as to the significance of proper management and leadership within an organization. Dr. Robinson quoted the iconic management consultant, educator and author Peter Drucker, who said, “Culture eats strategy for breakfast.” That simple, five-word phrase was as intriguing as it was familiar, especially when thinking about how much Technomics greatly values culture in a business world in which the bottom line seems to take precedence over culture and employee morale. Following the key note address, the attendees broke into technical presentations that were split into three different tracks. While the content of each breakout session was materially different, each session incorporated the theme of the forum (using new techniques to try and solve difficult problems). This included techniques such as Machine Learning, Artificial Intelligence, and Deep Learning, as well as Dynamic Modeling, Predictive Analysis, Cyber Security, and many other high-level methods and subjects. While some of the presenters were veteran practitioners in their fields with decades of experience and the highest levels of education, a majority of the technical presenters were very new to the world of data analytics and advanced quantitative systems. The Technomicians who attended found it was encouraging and empowering to see so many up-and-coming individuals who realize the importance of providing quality analysis using the most efficient methods. After the technical presentations, the attendees reconvened in the large conference room for lunch and to listen to a panel of global industry leaders explain their respective nation’s direction and the importance of emerging techniques in their industries and fields of study. After lunch and the panel presentations we split back into the three conference rooms for the second session of technical presentations. Finally, the day was capped off with poster presentations in the lobby area along with libations and good conversation. –Adam Letcher, Senior Analyst, Technomics, Inc. The second day followed a similar format with more featured speakers and technical presenters, who touched on interesting work topics and shared their wisdom and passion with the up-and-coming analysts. Those who attended found it to be a great event and look forward to next year’s ETF, as well as the annual MORS Symposium, which will be held June 17-20, 2019, at the Air Force Academy in Colorado Springs, Colorado. The MORS Emerging Techniques Forum really showed how Operations Research and Data Analytics communities are rapidly growing every day. As analysts who strive to provide useful analysis to decision makers, it is important for Technomics and our cost community as a whole to stay relevant in this vastly changing space by using emerging techniques (e.g., Artificial Intelligence, Machine Learning, and Predictive Analysis, etc.) to ensure we remain industry leaders and provide exceptional analysis to current and future clients.